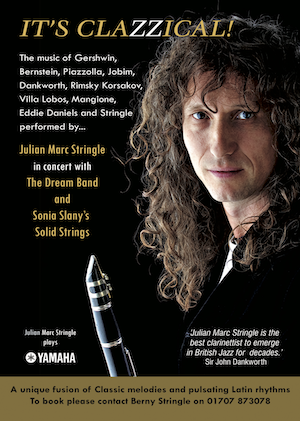 Clarinet maestro Julian Marc Stringle's "Dream Band" is a latin jazz-funk quintet of distinguished instrumentalists; keyboard virtuoso Neil Angilley, Canadian guitar star Dominic Ashworth, Bass ace Chris Dodd and dynamic drummer Mike Bradley. 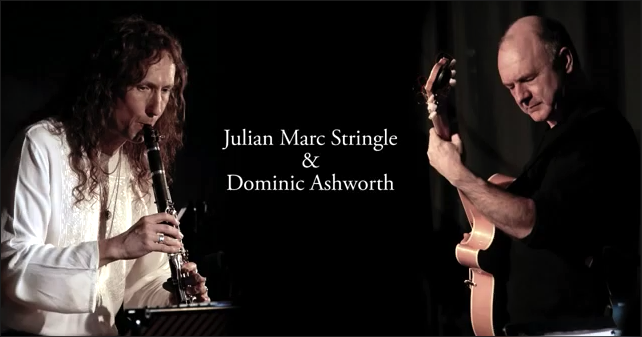 Before Sir John Dankworth passed, he gave Julian an original composition called ‘A Lyric Fantasy’ to perform with his band in the garden at Wavendon. 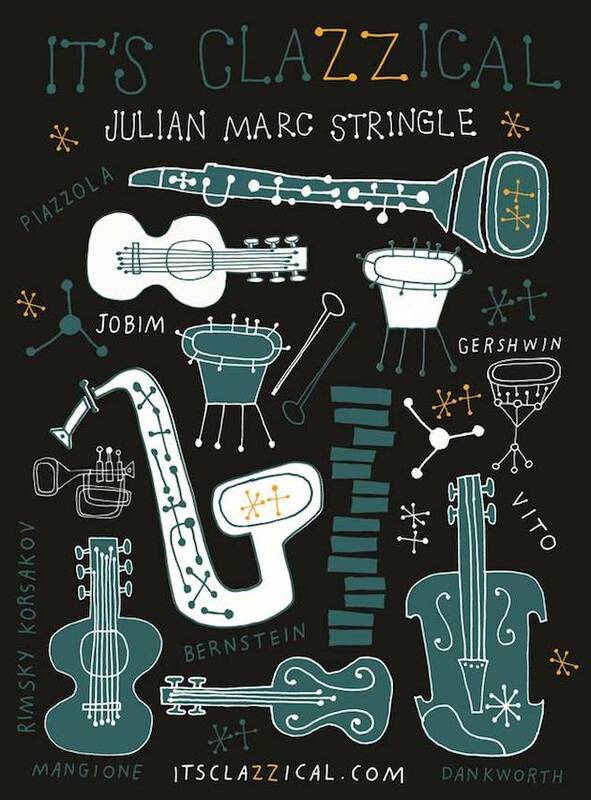 Together with a stunning suite from Bernstein's "West Side Story" score ‘A Lyric Fantasy’ has become the ‘foundation stone’ of a new concert that Julian calls ‘It’s Clazzical’ . The show is a collection of classic melodies and pulsating Latin rhythms performed by Julian with ‘The Dream Band’ & Sonia Slany’s Solid Strings augmented with brilliant Latin percussionist Marc Cecil . We have recorded themes by Aznavour, Bernstein, Bechet, Bonfa, Dankworth , Gershwin , Jobim , Lennon & McCartney, Mangione , Piazzolla , Rimsky Korsakov, Rodgers & Hart, Sedaka, Stringle & Villa Lobos. The tracks will be released on two albums the first It's Clazzical Volume 1 is available now. It's Clazzical is aimed at a wide audience. People who love classical music. People who love accessible latin-influenced jazz. People who love musical theatre. The emphasis is on beautiful melody & Julian’s unique sound. "The clarinet was from the start of jazz (as we know it today ) an instrument of enormeous importance. It's first wave of exponents from Johnny Dodds to Benny Goodman is no longer in charge, and the world needs a replacement from later generations. Julian Marc Stringle is already presenting his credentials to the royal circles of "Clarinetia" . Some would say that in Europe Julian has already received that accolade, which leaves him just one crucial step; Today Europe - tomorrow the world !" Australian born Sonia Slany trained as a classical violinist & pianist before joining ‘The Communards’ rock band directly from college. Sonia, has written & arranged for Mark Knopfler, Boy George & Bjork, and toured with Massive Attack, Meatloaf, Beverley Craven, Seal, Michael Nyman & Mark Knopfler. She is married to a life-long friend of Julian, the renowned percussionist Paul Clarvis.